Profesor Ayudante Doctor. Departamento de Didáctica de las Ciencias Sociales y Experimentales. ALCÁNTARA, J. A., & MUÑOZ, J. M. (2015). Estudios geográficos. “Landscape classification of Huelva (Spain): An objective method of identification and characterization”, vol. 76, nº. 279, p. 447-471. BLANKSON, E. J., & GREEN, B. H. (1991). Landscape and Urban planning. “Use of landscape classification as an essential prerequisite to landscape evaluation”, vol. 21, nº 3, p. 149-162. BUNCE, R. G. H., BARR, C. J., & WHITTAKER, H. A. (1981). Annual report of the institute of terrestrial ecology. “An integrated system of land classification”, vol. 1980, 28-33. BUNCE, R. G. H., & HEAL, O. W. (1984). Planning and Ecology. “Landscape evaluation and the impact of changing Land-Use on the rural environment. The problem and an approach”. En ROBERTS, RD & ROBERTS, TM. (Ed). Chapman & Hall. Londres & Nueva York. BUNCE, R. G. H., CLARIDGE, C. J., BARR, C. J., & BALDWIN, M. B. (1986). Land and its Uses—actual and potential. “An ecological classification of land-its application to planning in the Highland Region, Scotland”. Springer. US, pp. 407-426. BUNCE, R. G. H., BARR, C. J., CLARKE, R. T., HOWARD, D. C., & LANE, A. M. J. (1996). Journal of biogeography. “ITE Merlewood land classification of Great Britain”, vol. 23, nº 5, p. 625-634. BUNCE, R. G. H., CAREY, P. D., ELENA-ROSSELLO, R., ORR, J., WATKINS, J., & FULLER, R. (2002). Journal of environmental management. “A comparison of different biogeographical classifications of Europe, Great Britain and Spain”, vol. 65, nº 2, p. 121-134. CHERRILL, A. (1994). Journal of Rural Studies. “A comparison of three landscape classifications and investigation of the potential for using remotely sensed land cover data for landscape classification”, vol. 10, nº 3, p. 275-289. CHUMAN, T., & ROMPORTL, D. (2010). Landscape and Urban Planning. “Multivariate classification analysis of cultural landscapes: An example from the Czech Republic”, vol. 98, nº 3, p. 200-209. CLARIDGE, C. J. (1989). Rural Information for Forward Planning. “The approach adopted by Highland Regional Council", p. 21-28. COUNTRYSIDE COMMISSION. (1987). CCD. “Landscape assessment: a Countryside Commission approach”, p. 18. ENGLISH NATURE (1993). Strategy for the 1990s: Natural Areas. English Nature. Peterborough. FORMAN, R. T. T., & GODRON, M. (1986). Landscape Ecology. John Wiley& Sons. New York, 619 pp. FOODY, G. M. (2002). Remote sensing of environment. “Status of land cover classification accuracy assessment”, vol. 80, nº 1, p. 185-201. HABERMAN, S. J. (1978). Analysis of Quantitative Data. Volume 1 Introductory Topics. HAGEN-ZANKER, A. (2006). 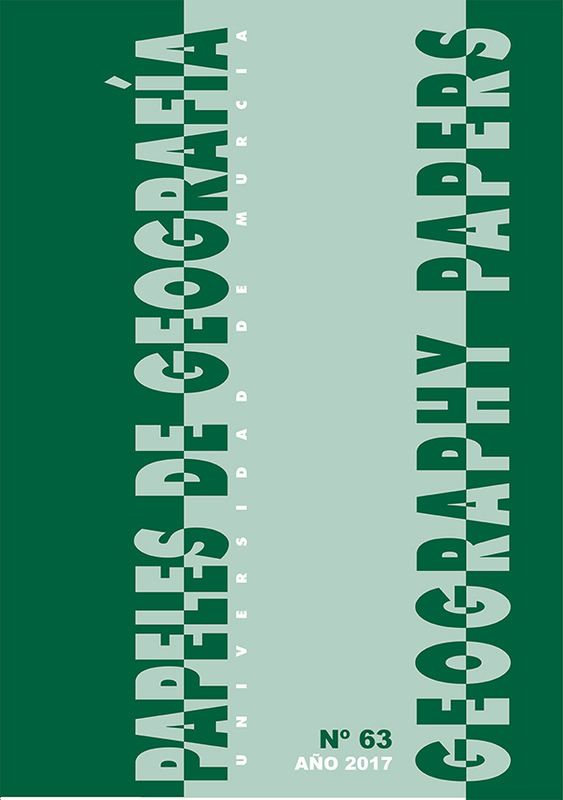 Journal of Geographical Systems. “Map comparison methods that simultaneously address overlap and structure”, vol. 8, nº 2, p. 165-185. HAINES-YOUNG, R.H. (1992): Landscape ecology in Britain, Proceedings of the first international associations of landscape ecology-UK meeting. “Landscape ecology and the countryside information system”. En Haines-Young, R. (Ed.). University of Nottingham. Nottingham. KENT, M. & COKER, M. (1992): Vegetation Description and Analysis. A Practical Approach. CRC Press, Inc., Corporate Blvd. Florida. LEGENDRE, P., & LEGENDRE, L. (1998). Numerical Ecology, Volume 24, (Developments in Environmental Modelling). MOREIRA, J. M. (2003): Geografía de Andalucía. “El relieve y las costas andaluzas I. Las grandes unidades del relieve andaluz”. En López Ontiveros, A. (Coord.). Ariel Geografía. Barcelona. MOSS, D. (1985). Applied Geography. “An initial classification of 10-km squares in Great Britain from a land characteristic data bank”, vol. 5, nº 2, p. 131-150. PITA LÓPEZ, M. F. (2003): Geografía de Andalucía. “El clima de Andalucía”. En López Ontiveros, A. (Coord.). Ariel Geografía. Barcelona. SANZ HERRÁIZ, C., MATA OLMO, R., GÓMEZ MENDOZA, J., ALLENDE ÁLVAREZ, F., LÓPEZ ESTÉBANEZ, N., MOLINA HOLGADO, P. AND GALIANA MARTÍN, M. (2003). Atlas de los Paisajes de España. Centro de Publicaciones. Secretaria General Técnica. Ministerio de Medio Ambiente. Madrid.